Daniel Moon has nearly worn a path between the dining area and modest kitchen of his family's new restaurant, Little Kyoto Japanese Kitchen and Sushi, while his father, Byoung "David" Moon, and mother, Young Moon, prepare food orders in the kitchen. Lunchtime is busy in the Hayden restaurant located inside a converted house built in 1940 — every table is full from noon to around 2 pm on a recent Monday — and Daniel Moon has his hands full with bento boxes and sushi rolls on the pared-down lunch menu. Sushi rolls cover the Americanized classics — yellowtail, tuna, cucumber, salmon — with a few surprises like the volcano roll, with scallop, masago (capelin roe), sprouts, and lava-like spicy sauces over a "mountain" of California rolls ($11.95). Try bento or lunch box entrées like salmon teriyaki ($8.50) or something a bit less common in the area's small-but-growing Japanese restaurant scene: a curry bento ($8.95-$11.95). 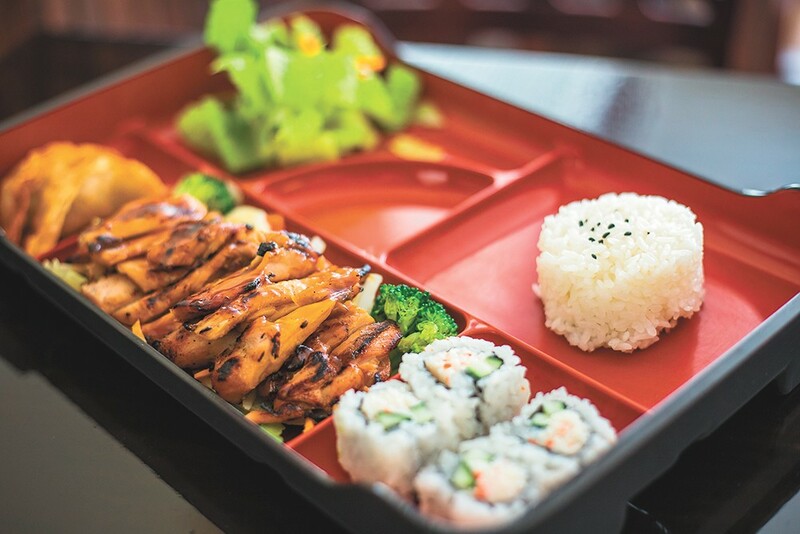 Bento boxes, served in a specially partitioned dish, also include steamed rice, miso soup, four California rolls, steamed gyoza (also known as potstickers), and salad. Although the bento box is known as a lunch box, it's also served on the dinner menu, which includes a vastly expanded sushi and special roll offering, as well as more appetizers, salads and entrées. Again, many dishes are what you'd expect on a Japanese menu: karaage ($6), tonkatsu ($11), yakisoba ($8) and udon soup ($8). There are surprises, too, like the stir-fried calamari rice bowl ($11) with chef's secret sauce (we're hoping it's gochujang, a fermented red chili paste typical in in Korean cooking) and something called a monkey ball, which is a deep-fried mushroom stuffed with spicy tuna ($6).